Nine Inch Nails new single “A Copy of a”: Trent Reznor muses on the postmodern condition on new song. 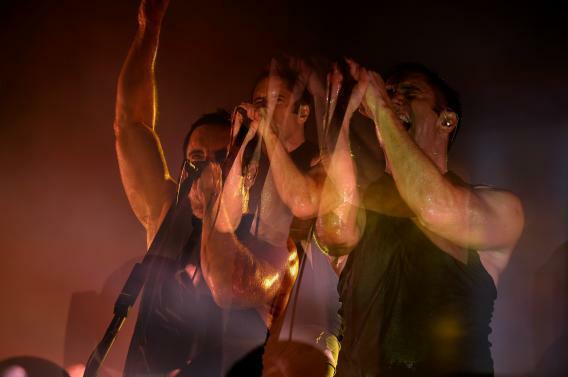 Trent Reznor is a “copy of a copy of a copy” in this (multiple exposure) shot from Lollapalooza 2013. As with “Came Back Haunted,” the song is an update on an old NIN sound. And, just as with that song, the lyrics also fit that theme: Reznor declares that that he is just “a copy of a copy of a copy,” and confesses, “Everything I say has come before.” Perhaps Reznor is musing on the postmodern condition, or just referencing Fight Club, but the real joy is listening to him and collaborators Atticus Ross and Alan Moulder strip the beat down and build it up again, each time with new elements. By the time they bring in the Swarmatron around three minutes in, they’ve found a way to make it new. “Copy of A” is available as a free download today via Amazon UK, and according to Pitchfork it will be available for free on Amazon in the U.S. tomorrow. The album, Hesitation Marks, is out Sept. 3.